NEWS ALERT! 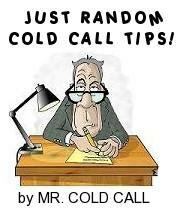 WE JUST ADDED A RANDOM COLD CALL TIP! Great question: "What can (Insert the name of your company here) possibly do to earn your business?" - this is a great way to let the customer tell you! Use Movie Lines to engage your prospects: There are a lot of great movie lines to use when speaking with prospects. For example, in the movie "Crazy, Stupid, Love" - Ryan Gosling says, "May I have your permission to speak candidly here?" - Great line to engage a prospect! Rule of Thumb: If a prospect hangs up on you (bite your tongue) just move on and don't waste your time ever calling them back. Immediately take them off your rotating list of prospects and replace them with another viable prospect lead. Can't figure out a prospect? There are some prospects that are really hard to read. In this particular situation ask them to respond to your email (i.e. to provide additional information about their company or an example of what they were discussing on the phone). While you may not really need this information to continue you are "testing their interest." Build Curiousity on each telephone call. Everytime that you speak and follow up with a prospect also leave each call as a "cliff hanger." Always give them another reason to speak with you again! Your entire conversation should be the following: "How can I bring value to you?" Then, once you demonstrate the value of your product and/or service then and only then you talk about PRICE. You should only really speak about price at the very end of your pitch. DO NOT EQUATE YOUR PRODUCT and/or SERVICE with a PRICE or COST, but rather use the word INVESTMENT or RETURN on INVESTMENT (ROI). The more confident that you sound over the telephone will always reduce the likelihood that your prospect will ask you how long you've been doing what you're doing. Learn more about developing a VOICE of Confidence! When someone is not interested in what you have to offer then you need to take this personally and say the following: "My prospect was not interested because I brought no value or nothing of value to the conversation." I know this sounds very funny, but think about it? It's really true! You brought NO VALUE. You can then use this recognition as a catalyst to make your next call that much better! What can you do now to add more value to your next cold call? If a prospect asks if a product/service is FREE then you simply smile and say the following: "Nothing is for FREE and if you think something is for FREE it's really not and we always must ask what's the catch?" Also, (Insert the first name of your prospect here), when something is FREE there are always limitations to what you can and cannot do. (Insert your example here). While sales is a numbers game it's important to understand that you must consistently repeat the same actions and behaviors (that are making you successful as a salesperson) daily to reap the rewards. It's the cumulative effect of your behaviors that will always lead to closed business. Always acknowledge your prospect's objections! Prospects want to know that you're really listening to them and when you overcome objections you will help your prospect make a decision as to whether or not they will buy from you! This customer needs professional help and they don't know it. They constantly jump on you with what they think are simple requests and do so with very erratic speech and tone. This customer will tell you their whole life story in the matter of just two minutes. This customer has a problem with either drugs or alcohol. This customer knows everybody and anybody and is a name dropper. This customer is a bully. They are insecure and need to compensate for their lack of self-esteem by bossing others around. This customer thinks everything that comes out of their mouth is funny, but it's really not. This customer thinks they can charm anyone into doing anything for them. This customer will constantly correct you in an effort to show you how smart they really are. This customer is known by company employees as the customer who will contact the CEO of the company if you take a misstep in customer service. This customer always says no and could care less about what you have to say. This customer always agrees to buy, but then later decides to reverse their decision. A common question used by salespeople to understand their prospect's business is the following: "Can you tell me a little more about your business?" This question is a good question, however, it's kind of overused. How about asking the following question to make it a little more interesting: "(Insert your prospect's first name here), walk me through your business so that I can better understand what you do?" "You know life has a way of throwing curve balls." "What are you really thinking?" "Why not just try us out? Who says you have to move everything?" "My only concern is that if I call you tomorrow then tomorrow will turn into next month, then maybe next year, what's holding you back today?" "You can't put a price tag on peace of mind." "Like Alexander Graham Bell said: When one door closes another one opens!" "Remember that not every investment is risky!" "Why not go with us? "Put aside the price for a minute, what else is important to you?" "Are we using MasterCard, Visa or Discover today?" "Have you done a side by side comparison?" "When was your last review and how often do you do one?" "Does (Insert the name of your competitor here) make you smile and why?" "I think you are testing me to see how many calls I will make?" "You know what they say? Pleasant persistance wears down resistance?" "So what do we need to say or do to make this a done deal?" How much can you earn as an inside sales representative? According to extensive research conducted by Pop Icon Mr. Cold Call™, the range can vary across the United States, but we will provide you with an average range. The range of base salary varied from $20,000 to $50,000. What are the ranges for potential commissions for these sales jobs? They can range anywhere from $10,000 to $50,000. Of course, these numbers are not set in stone, but rather, based on our researech, this is what we're seeing in the marketplace. If your bi-lingual then you can add from 15% to 25% to these numbers. Lucrative industries for high-earning potential include Software, Data and Medical. As a salesperson you need to always assume that that your prospect wants to and needs to do business with you. If you do take this road then of course, you will need to know when to draw the line and when you can and should not step outside those boundaries. When you assume this course of engagement it also helps to show some value of your product and/or service along the way. If you show no value then your prospect will base their decisions mainly on price. "Anyone can sell on price, but not everyone can sell on value." (a Mr. Cold Call Quote). So only assume the sale when you are confident that you have sold on value and not just pricel. So for example if you are in advertising sales, you could use the following: "(Insert your prospect's name here), this really makes a lot of sense, our (Insert the name of your product and/or service here) will help your business not just get new customers, but help you get these customers to return multiple times each month. Repeat business is what will get your business to the next level. We figured out that one new customer is worth (Insert a number here) so imagine if they kept coming back? Let's make this happen for you, we can help you! I can swing by your office tomorrow and we can go over the application? (PAUSE)." While there may be folks out there that say it's not right to assume, but when you do assume it shows a sense of vocal direction. And with vocal direction you can now be perceived as more of an expert or consultant. Ask questions to understand and offer solutions to solve problems. When a prospect is giving you pushback then respond with the following: "What do you think might be holding you back? Is there anything on your list that I can further clarify? (PAUSE) - Having trouble reaching the decision-maker? Click here for help! What do you say when you're unsure how to respond or don't know what to say to a sales prospect? Try the following line: "So where do we go from here?" What is the goal of your first contact with your prospect? Your number one goal is to set an appointment. Start making prospect calls at the beginning of the week to secure appointments for the following week. Set a target of five prospect meetings each week. Don't know how to respond to a prospect's objection? Caught off-guard? Try responding to your prospect's sales objection with another question. Ask them what chain of events brought them to such a conclusion? Basically, find out why they feel the way that they do? The more engaging questions that you ask will always trigger better answers as to why they may want to do business with you. Create a new folder in Microsoft Outlook called "Future Emails." Every time you email a prospect and they respond with either none, minimal or future interest store their email in this folder. Every three or six months go into this folder and respond to their email. Always remember that a NO by a prospect at one point in time is not always a NO. Prospects change their mind all the time based on circumstance. As a salesperson you must think like a dentist. Say what? Cold calling is about being proactive so part of this process means uncovering needs and then offering solutions. So where does the dentist part come into play? When you speak with prospects you will need to extract, remove or pull out information from your prospects as they may not candidly volunteer this information. When you embrace this type of dentist mentality then you will be on your way to becoming a more successful salesperson. As you make calls to prospects think of cold calling as a study of human psychology. Once you think of cold calling in such a manner you will begin to continue to test and retest ways in which you can successfully interact, engage and close more business with your sales prospects. "Those who resist the most need it the most." And yes that is so very true! You will find that those prospects who resist the most need your product or service the most. These prospects are screaming for your help and just don't realize what they are not seeing in front of them. In fact, their voice tells you that they have no interest, but their body language SCREAMS for you! You must help your prospect view the world with a different set of eyeglasses. Use examples, tell a story of how you helped a client, use industry and statistical data to support your statement, paint pictures of how your prospect might benefit from your product and/or service or maybe ask a question in a different way. View our cold call script library! What Is The Most Answerable Email Subject Line? When all prior subject lines fail to catch your prospect's attention then try this attention-getting idea: Go to your sent folder and find the original email sent to your prospect. Forward this email to them and in the subject line insert the following at the beginning of your subject line: "Second Attempt." Eye-Catching Subject Lines: One of the most read subject lines that you can use when emailing prospects is your prospect's FULL NAME. When you try this technique make sure that you keep the content in your email short and to the point. This means keeping your content to no more than THREE to FOUR sentences. In fact, one or two sentences would be the most ideal situation. Remember, people have a very short attention SPAN and a long email will always be the least likely to be read. LESS really is MORE! How many calls do you need to make to set an appointment? According to research conducted by Pop Icon Mr. Cold Call™, if you were to make 25 cold calls to prospects then you can expect to set anywhere from 1 to 2 appointments. And of course, this depends on your level of sales experience. On the other hand, if you're contacting existing customers (in particular we're referring to those customers that you've never really had an engaging conversation with) then you can expect to set anywhere from 2 to 4 appointments. These statistics increase if you decide to do pre-call research. Click here to find FREE BUSINESS LEADS! A one sentence solution to become a better salesperson. Ask questions that matter, identify a need and solve their problem by offering a solution. Remember that how you say something is just as important as what you say. This means that you need to pay special attention to your attitude. How much enthusiasm do you bring to the table? Think of yourself as a MAGNET. The more you embrace a positive attitude then the more your prospect's will be drawn to what you have to say. How many calls do I need to make to set an in-person appointment? Based on Pop Icon's research, it takes about 20 (well-researched) cold calls to set one in-person sales appointment. The more research and time that you take prior to each cold call will always result in greater cold call appointment setting success! After several contacts back and forth with your prospect they say the following: "We're staying put, but thank you." How do you respond? Try the following line: "(First name of prospect), I get what you're saying. If (Insert the name of your competitor here) happens to drop the ball, can you do me a favor and keep my number on file? (with a smile) I'd like to be your back-up quarterback going forward, ok?" Old School Selling is Back! What does this mean? Today, business owners and executives are getting slammed with emails. Because they get so MANY EMAILS they are now less likely to read your email. You can blame these behaviors on the technological revolution. I think we need to get back to the basics and this means good old fashioned telephone selling. Salespeople need to STOP EMAILING PROSPECT and start picking up the telephone to make things happen! Emails can be viewed as impersonal, but telephone selling is much more engaging. As salespeople, we need to act on this opportunity so that we can quickly capitalize on what most salespeople are not doing. And as result of these actions, you will have the competitive advantage! Don't spend other people's money! What exactly does that mean? This means that you cannot assume that your prospect can or cannot afford your products, services or associated fees. What can you say to a prospect to help them move ahead with a deal? Try the following line: (First name of your prospect), what would make you say YES? PAUSE. If the world was perfect what do we have to do to make this happen? Rule of thumb: Immediately after you leave a voice mail message for a prospect send them a sales letter. All letters sent need to be customized to your prospect's name and company. One week later, follow up with your prospect and keep following up with them till you actively engage them with dialogue. Remember that the "money is always in the follow-up" and not on the first contact call made to your sales prospect! What do you say to a prospect who gives you a really stupid response to your question? After you hear their stupid answer simply just pause and repeat their answer and then pause again. So for example, you could say, "Did I hear you just say (Insert what they just said here)" and then pause. If they continue to give you the same stupid answer then just move on. If they rephrase their answer and change it up a little bit then engage them with another question to find out what their true objection might be. This is the best way to hande stupid answers. What can you say to a prospect to really capture their attention? If you let a prospect know that they might be MISSING OUT on something (i.e. an opportunity to grow their business) then this will help to REALLY GRAB their attention: "(Insert your prospect's name here), I"m sure that you're aware that many of your competitors are using (Insert what you sell here). Do do you think that you might be missing out on (Insert a benefit statement here)?" Great salespeople show a sense of urgency and embrace the motto that "there is no time like the present"
Work with the office manager. And finally, target Doctors who are specialists in their field of medicine--avoid general practitioners who have waiting rooms full to capacity. Sales Proposal Tip #1: First meeting with a sales prospect? Always send a sales proposal right after your first meeting. If you're asking the right sales questions on your call then by the end of your meeting you should have a clearer understanding as to how you can help them. If you don't then you really need to start asking more engaging sales questions. Sales Proposal Tip #2: When creating your sales proposal your first line should read, "Customized Sales Proposal for (Insert company name) and then right below this text insert a picture of their Company Logo. Just visit their website, right click on the image, click to copy it and go back to your word document and paste it . A sense of urgency will immediately increase sales. If you are not creating a sense of urgency with your prospect that they need to BUY NOW then they will BUY LATER. Be direct with them, incorporate a sense of humor and ask questions that will motivate your prospect to say, "YES!" Here are few questions that you could ask at the end of your sales pitch: "What do you have to lose?" or "Which credit card did you want to use today?" or "Which day is better to stop by to sign the paperwork, this Tuesday at 3 or Wednesday morning at 10? Urgency, urgency and more urgency, what are you waiting for? I cannot think of a more EYE-CATCHING or WINNING way to create immediate interest with your prospect then by sending them a FedEx Package (with a sales letter inside)--use this technique when making your first contact attempt with them. When sending a letter of introduction to your prospect consider and incorporate the following ideas: Create a letter of introduction about your company that leads with solutions (or benefits), in your letter let your prospect know when you will follow up with them to set up a visit to their office, insert your letter into a smaller envelope, write their name on the envelope and then put this envelope inside the FedEx envelope and finally, follow up, follow up and keep following up! Create subject lines that grab your prospect’s attention. When you’re sending emails it’s very important to keep the contents of your email short and to the point. For subject lines, insert the full name of your company followed by a forward slash (/) and then next to this slash include two or three words that clearly indicate the reason and/or intention of your initial contact. Always remember that you can use other reasons as well and some of these reasons could include any of the following: to set an in-person or phone appointment, to prepare a proposal or to ask for their business. WHAT IS THE WORST POSSIBLE QUESTION THAT YOU CAN ASK A PROSPECT? If you ask your prospect if it's a good time to speak then that is the dumbest way to start a conversation. By asking for permission you are giving the prospect "an out." You are making it easy for them to say that they're not interested. Instead of asking for permission, try asking a question that sparks their curiousity. For example, this is (First name) with (Insert your company name here), have you ever thought about why you haven't used (Insert the name of your company)? Just ask a question that sparks their interest or a question that will engage them into deeper conversation. A great follow up line to an objection when a client (or a prospect for whom you have built rapport with) is obviously not interested (or when you they respond to your objection and the conversation becomes a bit awkward) is the following: "(Insert the first name of your client or prospect here), I was only letting you know because if I didn't let you know then I feel as though I would be giving you a disservice." There are 3 ways to increase sales. The first way is to expand your customer-base. The second way is to get your current customers to buy more units of your product and/or service. And finally, the third way is to increase the frequency as to how often your customers buy from you. When a receptionist answers the telephone always ask for your prospect by first name. If you ask for them with "Ms. or Mr." then you have revealed your identity. It makes you sound like a salesperson. Now at least if you use their first name the receptionist may not be 100% sure about your intentions and actually put you through to your prospect. Also, Sherlock, it really helps things if you know the name of your prospect before you pick up the telephone. You should always be asking for the business owner. Any other prospect is a complete waste of your time and mine for that matter! Click here to locate business owners! Do you ask a prospect if they have time to speak? When asked about this question, Pop Icon had the following words of cold call wisdom, "NO! Absolutely not! You're giving the prospect a way out. Rather than asking your prospect if they have a minute just go ahead with your sales opener. Listen closely to their tone and fluctuations in their voice. Some prospects will just let you continue and others will make you feel as if they are really inconvenienced by your telephone and if that is the case ask for an immediate follow up call. If they do agree just quickly respond with a thank you and add a sentence as to the reason for your next telephone call." 1. Never underscore a competitor. If a prospect or client mentions your competitor don't put them down. Try to avoid the bully game. 2. If you don't know the answer to a question don't pretend like you know the answer. You will get much more respect if you let your prospect and/or client know that you will get the answer. 3. Don't make promises about products and/or services that you can't keep. It's better to be completely straight up and honest. There are some salespeople who just want the sale and could careless about how they do business. While these sales reps may get the immediate sale their success will be short-lived. 4. Follow up to the minute, hour and day that you had promised to contact your prospect and/or client again. Poor follow-up is unfortunately a very common trait amongst salespeople. 5. Never share information or company names of your clients with your prospects. Transform your sales with these 5 Practical Ideas: 1. The more you know about your product the better questions you will ask. When you ask better questions you close more sales. 2. Demonstrate value and price becomes less important. 3. Become a storyteller when engaging in a conversation with your prospect. Real-life customer examples grab prospects and give them practical ideas as to how you can help them. 4. Remember that pleasant persistence wears down resistance. 5. Ask questions to find pain points and offer solutions as to how you can solve your prospect's problems. Did you recently follow up with a prospect that received one of your sales prosposals and they will not respond to your voice mail messages and email reminders? Isn't that really frustrating? The truth is you spent all this time with them and now all you get is the silent treatment? Chances are your prospect may have gone to one of your competitors, but that's not always the case. There are countless reasons why you did not hear back from them! In an effort to reach your prospect sometimes all it takes is the concept of "Less Means More." What does that mean? If you emailed your proposal then you can try this simple, but catchy sales proposal technique: Near the end of your sales day go to your original emailed proposal and in the contents of the email say the following (without the quotes): "See below, Can we get this knocked out tomorrow? (Insert a happy face here)" -(Insert your name here)." This sounds too simple, but this has been tested multiple times over and the outcome has consistently been that IT WORKS! Tell a story to your prospect to make your point even more relevant. Ever wonder why the most successful speakers use examples to capture their audience? They use examples as a hook to draw in the attention of their audience. The use of examples are a catalyst that speakers can use to encourage an affect such as changing a certain behavior, a belief or taking action. This concept can also be applied for use in the sales world as well. When was the last time that you used a real-life example to demonstrate how a product and/or service saved a client time or money? Examples will engage your prospect, inspire questions and get your prospect thinking more about what you have to say and what you have to offer. Examples bring you one step closer to both a commitment and a sale. What is a Cost Analysis (also called Cost-Benefit Analysis)? This analysis is an outline that showcases a side-by-side comparison between your product and/or services and that of your competition. As a salesperson, you can use this analysis to highlight the specific benefits (i.e. savings) over your competition. This comparative analysis can be conveyed either through a diagram, a chart or through an MS Excel worksheet. Which ever visual template you decide to use make sure that you keep it simple and straightforward. So the next time you speak with a prospect let them know that you can do a Cost Analysis to make sure that they're getting the best deal in town. Yuo just can't put a price tag on peace of mind! Are you ready to send out sales flyers to prospects and need an affordable graphic designer? Spending 15 minutes each day studying your company's website will make you a better salesperson. How much time do you devote each day to reviewing the products, services and company information on your company's website? Your company may have a new product demo that could help you to update you on certain product features and benefits. You may find links that you thought never had existed that could be sent to prospects as follow up points of interest. The point here is as salespeople we need to be constantly learning and we need to know our product and/or service (and that of our competitor) both inside and out. Product knowledge will without a doubt make you a better salesperson and help to significantly build your book of business. Get a customized cold calling script for your industry! Ear-Opening Sales Openers that WOW prospects! Your most lucrative sales will always come when a prospect first responds to you with a flat NO. Eat Sales Objections for Dinner. You need to be a dentist. You need to extract information from your prospects to uncover their needs. Prospects sometimes don't see what they need so you need to be their compass. Become a clown and sell like a superstar! Follow up is the biggest reason why sales are not made. Listen more to your prospect so that you can ask better questions. All it takes is one very engaging question to turn a NO to a YES! Review products information in between your sales calls. I make more calls than you! Is this smart? How often do you take your prospect's pulse? Every so often throughout your conversation with your prospect Pop Icon Mr. Cold Call™ recommends that you check in with your prospect (i.e. ask an open-ended question) to collect their immediate thoughts. So for example, after you suggest a product or service you could say the following: "How's that sound?" or "What do you think so far?" Whose up for some sales role play? Say what? When was the last time you and your fellow salespeople took turns being the customer and sales rep? Did I just hear a BIG GULP? I know it can be a little bit scary the first time around doing something like this in front of your sales team, but it will help you become a better salesperson. To ease the stress a bit try to split off in smaller groups and then rotate with others across the room. It may not feel comfortable, but it will help you improve your closing ratios. When your done then you can ask the other co-workers to critique you. Grab new business after ONE YEAR! Business owners change their minds all the time and no decisions are ever set in stone. What is true TODAY for a prospect is not always true TOMORROW. One question can change the way someone perceives the world. One salesperson may really connect with one prospect while another salesperson dealing with that very same prospect may experience a personality clash. Where is Pop Icon going with all of this? If you have prospects that you have not reached out to in one year then why not attempt to reach them again? And to make things even more interesting, have you ever thought about calling on sales leads that were followed up by other sale reps at your company? Pop Icon also recommends that you discuss this idea with your co-workers and manager first, however, always remember that what didn't work out well for you last year (in regards to a lead that you had contacted) may end up being a diamond in the ruff for another sales rep.
How do you not smell like a salesperson? The first step in not smelling like a salesperson is to embrace a consultative approach to sales. If you fail to do this step then your prospects will immediately tune you out and you will not be given a chance to win their business. A great way to become a consultative salesperson is to know the features and benefits of your product. A feature is what your product/service has or does and a benefit is something of value or usefulness. Have you really taken the time to do this? If not, take the time and do it! You will be amazed as to how much this will help you to sell more! Always remember that all it takes is one great idea to increase your sales. ASA Design Studio can help you to redesign your business flyers, brochures, catalogs, postcards and advertisements - CLICK HERE! How would you like a sales idea that could potentially change your life? This idea will put more money in your pocket and only takes 5 to 10 minutes each day to do and the best part is that it's so easy to do! All you need to do is just review one product or service that you sell on a daily basis. Yes, this sounds so novel, but it works and the truth is that most salespeople do not follow this fundamental principle on a consistent basis. Knowledge is power! And with more knowledge you will now be able to ask more engaging questions. And with more skillful questions you will now be able to engage your client and/or prospect in a more impactful way. Examples may include the following: Online demos, company brochures and product/service links that are located on your company's website. Check out The Pop Icon Mr. 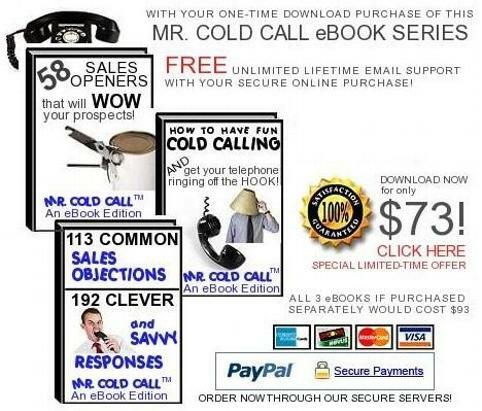 Cold Call eBook Series with FREE Unlimited Email Support! Are you having an Upcoming Free Seminar? What are the stats as to how many people will attend your seminar? First, your attendance will increase if you offer either breakfast, lunch or dinner. Secondly, your actual attendence at the seminar is typically at 40 to 50 percent of the total sum invited (i.e. invited 100 people and 50 people may attend your seminar). And finally, you can increase attendence by either confirming with your guests via telephone a few days prior or via individual emails sent to your invited guests. How does the sound of your voice affect your new business development efforts? TONS! It's a HUGE FACTOR! Whether your prospecting by telephone or in person if you do not convey a strong sense of enthusiasm and confidence in your voice then you will not make it. You always need to be conscious of your tone. That means you should sound confident. Confidence comes with preparation and enthusiasm starts with you. Be enthusiastic and you will sound enthusiastic. People will give you more of a chance. They will listen to you more. As a salesperson, you need to understand the importance of this idea and how your voice has such a strong affect on those we prospect with on a daily basis. How to have fun cold calling and prospecting! Pop Icon Ideaology: Check out this is a real-life example of someone who embraced the ideas and concepts of Pop Icon Mr. Cold Call™ - CLICK HERE! What is your objective on the first sales call? Introduce yourself, your company, offer a review and ask for an appointment (or visit). When we use the words "offer a review" we are referring to your product or service that you sell. If you're a sales rep for a roof repair company and you're contacting building owners then you could offer to analyze their roof to insure the protection and safety of their real estate investment. Have you thought about sending out a direct mail piece to local prospects in your area? Let us design your postcards, flyers and brochures! Keep your communication with your sales prospect simple. The fact is time is a commodity. Lengthly sales pitches lose meaning and long-winded emails never get read. When you talk too much you really should be listening more. What can you do today to make your communication with your sales prospect more effective so that you quickly get your point across? Who says that you need to move everything? Why not just try us out? Let us be your appetizer. Let us be your back-up quarterback. Why put all your eggs into one basket? What happens if your supplier drops the ball? What does all this mean? This means that it's ok to let your prospect know that you don't want all their business (well at least not now, but they don't know that). What's wrong with trying us out a little bit with one of our products or services? This way if they use your company then they have another back-up source for an immediate future need. And finally, if you have continued to follow up with a prospect then you can also say the following: "(First name of prospect), if I've been so persistent in trying to reach you then can you imagine how hard I will work for you when we ultimately get your business? Do prospects call you back from a voice mail message that you had left? Prospects will return your telephone call if you make your message sound enthusiastic and if you include information that quickly identifies you and your company and finally, if you make the message sound curious. So for example if provide commercial cleaning services then you could say the following: "(Insert the name of your prospect here), this is (Insert your full name here) with (Insert your company name here) and I would like to speak with you about how employees, visitors and clients perceive your office space. My number is (Insert your number and say it twice)." Another example, let's say that you provide commercial landscaping services then you could say the following: "(Insert the name of your prospect here), this is (Insert your full name here) with (Insert your company name here) and I would like to speak with you about the exterior of your building. My number is (Insert your number and say it twice)." Do you want another example? Let's say that you sell life insurance then you could say the following: "(Insert the name of your prospect here), this is (Insert your full name here) with (Insert your company name here) and I would like to speak with you about protecting your future. My number is (Insert your number and say it twice.)" Anyone that you do business with is FREE ADVERTISING for what you do! What this means is that every person that you do business with is a potential prospect. Think about the following, "Who do you do business with on a daily basis where you could suggest your product or service?" Let's say that you're returning a rental car from a business trip then why not say the following to the office staff prior to your departure: "By the way, I wanted to let you know that I work for (Insert the name of your company here) and if I can ever help you with (Insert a list of products and/or service and include one or two benefits)." If you did this twice a day and handed out your business card (and collected cards as well for follow up) to two prospects then that's 10 new prospects a week, 40 prospects per month and 480 new prospects a year. How much more business could you close? Use the Rotating Prospect List Approach: This approach is simple and all you need to do is assemble a list of your top 100 prospects. Prospects are rotated out of the list if there is no interest, you continue to follow up with prospects who have current and future interest and as prospects exit your list you replace them with new prospects. Have you ever tried this? Here's a great line to use with prospects: "(Insert the first name of your prospect here), if I have been so persistent in trying to reach you then can you imagine how hard I will work for you when you actually need our services/product?" What is one sign of a successful salesperson? If you walk by a co-worker's desk and you think that they're talking to you then that is one true sign of a successful salesperson. Successful salespeople sound relaxed, easy to speak with and conversational and these are all positive attributes that make a salesperson very successful. Walk around your office and try out this experiment. Do you need a fresh new look to your marketing brochures, catalogs or flyers? Check out ADA Design Studio! Do you sound desperate over the phone? If you do sound this way then you can be sure that your prospect will sense it. The best way to counter this perception is to understand and become constantly aware of this perception everytime you pick up the telephone. This might be an obvious idea, but many salespeople have these signs of desperation in their unconscious mind and as salespeople we need to always bring these perceptions to our conscious mind. BUILD RAPPORT BY FOCUSING ON ENGAGING BOTH YOUR PROSPECTS AND CLIENTS WITH MEMORABLE IRRELEVANT CONVERSATIONS. Did I just read what I thought I just read? Yes, you did! It's ok to stop talking about business for a minute and start talking about subjects such as the weather or points of interest related to the city that you're calling such as common places visited nearby (i.e. monuments, restaurants and schools) or even favorite sports teams---the more that you can find in common with your prospect and clients can only mean that you're building their trust and with trust comes the opportunity to build your book of business. It's always tempting to send a sales package to your prospect. So for example, you get someone on the phone and then you immediately offer to send them out additional information. Is this always the best approach on the first call? As a rule of thumb, try to hold off on sending a sales package on the first conversation with your prospect. When you follow up with your prospect (your second contact) and they are still a bit resistant then use your follow up call as a means to confirm their address so that you can send them a package. Your goal however, is not to send them a package, but rather to really engage them in additional conversation The idea of sending them a package is really another way of engaging your prospect with more meaningful dialogue. The goal of each follow up call is really dependent upon the length of your sales cycle. You can spin it anyway that you'd like, but sending a sales package can help you buy more time to engage your prospect with real conversations about your prospect's needs and wants and with more of "these conversations" comes the opportunity to build rapport and business opportunities! What is the The Money Book? This book is actually a notebook that every salesperson should be using as they speak with both prospects and clients. This idea sounds so simple and logical, but very few salespeople use this method. The use of this notebook is a great tool to have as you look back at what you had said to someone on a particular day and also comes in handy as well when a great idea immediately comes to you (i.e. a voice mail that you had left that actually returned a callback). Every Great Salesperson is a Great StoryTeller! If you look at every great speaker throughout our history they were persuasive because they were great storytellers. People are magnetized to stories. The next time your prospect says that they're not interested then you can say the following: "I will put my card in the mail for you so that you can keep my information on file. Also, you have to forgive me, I always tell this short story when I meet or speak with (Inser your prospect's profession here and then proceed tell your very compelling story)" Your compelling story needs to be just that--it needs to be inspiring and motivational. You need to also make sure that your story is short, spoken with expression and specific to their industry, otherwise, your story will have no affect whatsoever. What stories can you tell? Need a graphic designer? Check out www.asadesignstudio.com! Keep in touch with both your prospects and clients with articles of interest! What exactly does this mean? This strategy is a great way to build rapport with both business owners and executives. It spells out the following: "I really do care about you and I want to help you!" How do you get started? First ask yourself the following: "(Insert your first name here), who are my most profitable clients? What industries are these clients in?" Once you have determined the most profitable industries within your clientele then search the internet to find FREE newsletters related to those industries (i.e. industry associations or trade magazines). Create folders within your emailbox that allow you to save these industry newsletters. Forward relevant articles and tips to both your clients and prospects. Another recommendation is to subscribe to FREE newsletters from statewide and local news publications. The point here is the following: "Become a resource for both your clients and prospects because they will think of you when they need your product and/or service in the future!" No decisions are ever set in stone. Your prospect may say "NO" today, but may change their mind over a period of time. So, the next time that you email your prospect and they respond with the following: "I'm not interested" then save this email. Try creating a special folder called: "2012 No Interest." You can even respond with something like: "Thank you for your time and consideration. We welcome your business at anytime in the near future." In 2013, you can go back to this folder and let your prospect know that you are still very interested in their business and that you would like to set up an office visit. Chances are your prospect may be open to a meeting. First, you planted a seed with them a year ago. Secondly, decisions change over time and prospects now realize that they have other options. Thirdly, your follow up demonstrates that you are still around and that you're stable (a lot of companies have high turnover of key employees). And finally, your prospect may find it hard to say "NO" to you a second time around and may be more open to a visit from your firm. WHY SHOULD YOU COLD CALL? The number one reason why you need to cold call is because your competitors may not be servicing their clients the way they really need to be servicing them. Yes, it's true! There will always be unsatisfied and poorly serviced clients. It just happens. Companies get too large, clients get ignored and as a result, customer service drops like a brick. An unhappy client of your competition is and will always be your best friend. These clients (your prospects) may not know anything about you and keep brushing off their bad service till they realize that they actually have viable options. Why haven't these clients moved to another vendor if they think the service is terrible? There could be countless reasons why a move has not been made, but one of these reasons could be as simple as just one word and that word is CHANGE. They just don't like change, but there is something called the BREAKING POINT and this only happens when you make that cold call and let your prospect know that your company is very interested in doing business with them. Clients from your competition who are receiving poor service feel as though their current vendor doesn't really care. So when you find these prospects you need to let them know that they're always welcome at your place of business. It's important to know that there are not just a few of these types of prospects out there (meaning unhappy clients of your competition), but you must understand that there are tons of these types of prospects (you just need to find them). One way to find these prospects on a large scale is through strategic B2B cold calling via the telephone or hitting your local office/industrial parks in your local area. The New Business Development Cold Call Coach! SHOULD YOU GIVE UP ON HOT PROSPECTS WHO DON'T CALL YOU BACK? Before you even answer this question, you need to define what is a hot prospect to you? There are some reps who just dial for dollars with no regard for the quality of the prospect, but rather they focus on quantity. For this reason only I would argue that the least successful salespeople prospect this way. And the most successful (top 20%) really have a firm grasp of who are the most lucrative prospects to build their book of business. For these salespeople they may decide that a prospect is a HOT PROSPECT because they're a market leader, have been in business for many years, have sales volumes between "X" and "Z", are advertising in the market place (a great sign that they have deep pockets). So if you're calling on a hot prospect and they don't call you back I would continue calling them over a period of time till you reach them. For each contact perhaps you want to try something different and this could mean sending an email, a pesonalized sales letter, a promotional gift in the mail from your company, an in person visit or an article they may find of interest with your card attached to the article. If your having a tough time making your numbers always remember that sales is like a roller coaster and in time, you will bounce back. The glory days are here to come! The number one factor in your sales success is a positive attitude. Do you really think that a prospect is going to buy from you with a frown upside down? Yeah, I didn't think so! The next time that you hear your client praise your outstanding customer service then you need to immediately ask for a referral. Asking for a referral can sometimes be very awkward, so when you receive a compliment from your client follow up with this question: "Can you think of anyone else that you know that might be unhappy with (Insert what you do here and then PAUSE)? Take a minute to think about your sales day yesterday, what did you do throughout the day? Do you think that you could have been more productive? Did you go on a sales appointment? How did you maximize your time after the call? How much time did you spend in your car? After meeting with a prospect (or a client) drop your card off at a few nearby businesses. This concept is even more productive if you pre-plan which businesses you will visit. Call these prospects the next day to set an appointment. If you do by chance speak with the business owner then your number one goal is to set a future visit to their office. Bring a list of hot prospects with you where ever you go. Make sure that this list includes the name of the business owner and their telephone number. As you drive to and from to work or to sales appointments look for hidden industrial parks. These parks are like prospecting gold mines. Be on the lookout for these gems because if it took you a long time to notice these hidden parks chances are your competition knows nothing about these prospects. If a sales team member just left your company see if you can pull up a list of prospect's from that former sales rep. Why should those leads be left uncalled? If you can't help a prospect then let them know that you can't help them and do this in your upfront agreement with them. Never ever string anyone along as that is not the right thing to do and as salespeople we need to adhere to our attributes of honesty and integrity. Prospects will appreciate your honesty, but they will not tolerate salespeople who lie or cheat to move ahead in the game of life. If you hear a receptionist say, "(First name of your prospect) has no interest." They are right because either do you. I would just move on to your next prospect. It's not worth wasting your time and energy. Thank them for their time and go to the next prospect. In these type of situations it's the gatekeeper who is really making every effort possible to weed you out. Save them the trouble and time and just move on to the next prospect. Prospecting is like mining gold, takes awhile to find the nuggets! More Pop Iconic Quotes! If you feel as though you have been dancing around your prospect for their business and have not really asked for the business then guess what? It's time to ask for the business: "We are very interested in your business, (First name of your prospect), what do we need to do to make this happen?" When a prospect says that they're not interested it's a test. Ask your prospect when their last review was of (Insert what you sell here)? Let your prospect know that information is their best friend for future decisions to be made. Knowledge really is power. Even if your prospect made it very clear to you that they have no interest always remember to end the conversation on a positive note. You could say, "Decisions change all the time, we welcome your business in the future--the doors are always open! Pause and see how they respond because they may just ask you to follow up in a few months. Keep your sales pitch short and too the point. If you try to come across too wordy then that's a really big turn-off. On your initial call what is your goal? If your goal is to get an appointment then ask for the appointment in the first 30 to 60 seconds. I've found that if you come across with too much song and dance then your prospect will quickly brush you off. If your prospect agrees to meet with you then there is always a reason for a meeting. You can get into your your benefits mindset at the meeting. So for example, if you sell commercial cleaning services then you could say the following: "(Insert the first name of your prospect here), this is (Insert your full name here) in the Office Cleaning Division of (Insert the name of your company here) and we clean many of the offices in your office building, we'd like to set up a visit to your office during the week of (Insert a date here) to discuss some of your cleaning needs, how does your schedule look?" Some might argue where are the specific benefits? Sometimes less is really more. Ask for the appointment and then talk about benefits. Again, when a prospect says YES to a meeting there is always a reason beind their decision. It's your job to uncover it. If they do agree to a meeting over the phone (your results will always increase if you come across very positive, enthusiastic, upbeat and confident) then you can ask a few engaging questions to better prepare you for the follow-up call or to pre-position why you want to stop by and visit their office. Have you ever had a situation where you call a prospect (i.e. the business owner) and they say the following: "Can you call my Controller (or Office Manager)?" Then you proceed to call the Controller (or Office Manager) and they say, "You need to speak with the owner." If this happens to you then just stop the game and go on to your next prospect. They are playing a game with you and it's much better to cut your losses now and just move on. The importance of honesty and integrity in the sales process. A prospect calls you and says the following: "I just spoke with a competitor of (Insert your company here) and they are offering the following benefits XYZ." Do you put down your competition? Never ever put down your competition because that makes you look really bad. It will destory your credibility. Be kind and alway be honest. You could respond with the following: "Yes, they are a great company and without question they are giving you a very enticing offer, however, the main difference between their offer and our package is the following (Insert one stellar benefit here)." Your prospect will appreciate your complete honesty and if in the end, the other offer sounds better then you can let your prospect know that! Always keep the doors open and let them know that their business is welcome at anytime. Write down your top FIVE clients and send them an industry related article via email (make sure that you properly source the article--this means that you should let them know where you found it). In your email let them know that you have taken the time to highlight a few key areas within the contents of this article and you can include the following: "I hope that you find this very informative please do forward this email to a few of your colleagues within your industry." This is a great way to increase referrals! When was the last time that you had targeted a local industrial park? Since industrial parks have hundreds of businesses within a very small proximity your time will be well spent and razor focused. Pop Icon suggests that you spend one day writing down the names of these businesses and then taking the time (at your office) to match each business with the name of its business owner. We encourage you to use your state government's public records database to locate these names. Click here to learn more! As you begin compiling your list, we recommend that you visit 10 or more of these prospects on a weekly basis. Let your prospects know that your company is very interested in their business and that you'd like to schedule a future visit to their office. Bring some promotional material with you and some business cards. This technique of visiting prospects in-person is a great way to build your sales pipeline and a very effective way to diversify your marketing efforts. Check out these door to door sales tips! There are some who think that cold calling is about making just one call in hopes of landing a sale. That is so not true. Then there are some who think cold calling is degrading. That is so not true. Then there are those who perceive cold calling as a series of "touches" or "contacts" in which over time create a buying opportunity for the salesperson. And as a result of these systematic contacts the salesperson becomes memorable. When I say memorable I'm talking about a sales prospect who thinks of you when they're looking for a vendor OR a prospect who thinks of you when you call at just that opportune moment. And that is so true! Click here to view practical sales tips that you can use to instantly become memorable with your targeted sales prospects! I've heard some sales people say the following: "The only way to meet high-profile prospects are at networking events." My reply has always been the following:"Not everyone thinks like you or sees the world the same way as you do. Networking events are great, however, not everyone goes to networking events and that is one reason why you need to incorporate cold calling as part of your overall strategy for sales prospecting." When meeting with prospects try to warm up your conversations with them by making small talk. Did you notice something interesting hanging on the wall in their office? Did you come across an interesting item in their biography? Did you read about a new product in their industry? Choose an industry to target and select 10 targeted sales prospects in that industry. Prepare a signed letter targeted to your prospect's industry and address each letter to your target prospect. In your letter include the reason for your contact, focus on solutions and indicate that you'd like to set up a visit to their officer during the week of (Insert a date here). Place your letter into an 8x12 vanilla envelope and write your prospects full name in the middle of this envelope. Furthermore, at the bottom left hand corner write the following: "CONFIDENTIAL." As an additional suggestion, I would recommend that you inlcude your company and contact information in the upper left hand corner of the envelope as well. Next, you will hand deliver each envelope wearing professional attire (have another employee of your company join you) and when greeted by the receptionist I suggest that you say the following: "I'm with (Insert the name of your company here) and we have a confidential package for (Insert the name of your prospect here)." If your prospect is available to speak then you can introduce yourself and if they're not available then you can leave your package with the receptionist and follow up with your prospect the next day. Your number one goal is to set up a face-to-face sales visit to your prospect's office. Keep your sales openers and emails to prospects short and to the point. With all the advertising messages and stimulus that each of us encounter on a daily basis the following motto" "Less is more" is how you can immediately increase your contact ratios! Looking to bypass the gatekeeper? The next time that you send a package to a prospect write the following in the bottom left hand corner: "SPECIAL DELIVERY FOR (Insert the full name of your prospect here)." Then when you follow up with your prospect and the gatekeeper questions your telephone call you can respond with the following: "We had sent a SPECIAL DELIVERY package to (Insert the full name of your prospect here and then pause). While this technique sounds very simple to do it helps to build the perception of importance in the eyes of the person answering the telephone call. Click here to learn more about how to bypass gatekeepers! Sending a letter to a prospect? In the left corner of the envelope try writing a short question to inspire a sense of curiosity. For example, if you're a business broker trying to reach a business owner you could say, "Do you know how much your business is worth these days?" Or, if you're an accountant you could say, "Do you think that you may have missed a deduction last year on your taxes?" Another option to inspire interest is to include the following on your envelope: "Personal and Confidential." Even if a prospect told you flat out that they're completely happy with their current vendor you could follow up with a letter to thank them for their time. In this letter, you could mention that it never hurts to have a second opinion and include a brief summary as to how you can help them. You could even use a list of bullet points and then highlight one or two of your points so they STAND OUT! Why should your prospect buy from you? How can you make their life easier? How can you increase the efficiency of what they do? How can you speed up certain systems they already have in place? Think about benefits! Visit your prospect's website and find something that you can incorporate into the first call. Are you asking for low-level decision makers OR are you asking for the business owner? Anyone besides the business owner is a complete waste of time. If you don't buy into this idea then you're a "Justification Machine." - this means that you will think of every reason why you should not be speaking with the business owner and make yourself believe that you should be speaking with everyone besides the business owner. Insecurity is your best friend here. Instantly locate business owners! Are you calling on the right sales prospects? Have you taken time out to really think about which customers are buying from you? Do you really know who your customers are? Once you have determined the prototype of your perfect sales prospect then you need to focus your sales prospecting efforts on those companies who have the highest revenues. Send your prospect a customized letter in the mail (signed by you) to meet with you and attach a $20 bill. Offer your prospect the opportunity to speak with your CEO. Ask your prospect, "What can we do to earn your business?" Next time your prospect says, "We have no interest." Make a joke and let them know that you'd like to be their back-up plan. No decision is EVER set in stone - people change their minds all the time! Find a sales prospect that you had called exactly one year ago that had absolutely no interest in your product or service. Make mention of this time frame on your call and reinforce your persistence. Always remember that your follow-up call says to your prospect, "We're still around!" When is the best time to make cold calls? Anytime is a good time. If you've been told that there are better days and times to make a cold call then guess what? That's a myth! There is no "perfect time." Once again, what matters the most is the time that you invest prior to making each cold call and the daily consistency of these outbound prospecting calls. Learn more! Do you use Microsoft Outlook? Make sure that you actively set up reminder alerts within Outlook that remind you about contacting prospects on a specific day. Even if you use a contact management system Outlook is a great back up software program to use. You can also use Outlook to set up alerts that remind you that you need to ask for referrals from current customers OR use Outlook to remind you that you need to prospect within a certain city, town or county. Remember this tip: "Just because a prospect says NO today it doesn't mean they will say NO forever!" The first call that you make to a prospect is VERY POWERFUL. Prior to your initial cold call your prospect didn't think about whether or not they had any viable options, but now your introductory call gives them a viable option. You have now created an opportunity for your prospect to think about alternative options and your first contact is just the beginning of what I call the seeding process. The concept of this process is really simple: "Cold calling is not about the first call it's really about the follow-up calls that you make!" Remember that 80% of sales are made on the 5th to 12 contact. The secret to successful cold calling is about strategically reaching out to your prospect on a consistent basis. This means you need to contact your prospect over a period of time and not just one time. Your contact frequency (how often you contact your prospect) could be one month, three months, six months or years. A contact doesn't necessarily have to be a phone call it can also be an email or a hand written thank you note for their time. This may sound a bit too much, but it's reality, it's how you generate new business by initially contacting a prospect over the telephone. Here's the bottom line, "You either decide to play the cold call game and build your sales pipeline OR decide that this game is not for you!" Look up industry information about your prospect's industry before you contact them. Use this newfound information as you speak with your prospect to illustrate that you have a genuine interest in really helping them. The most important reason why you need to "weave" this component into your delivery has to do with the fact that this strategy helps you incrementally build credibility. And credibility is a needed element when people decide to do business with you! Overloaded with emails? Try creating various folders with specific names labeled to them to store emails for future reading. Contact your 10 best customers and ask if they would submit a written testimonial. This testimonial should include the reason why they do business with you. With their written testimonial they can include their name, company name and other contact information. Why would they take the time do this for you? Because you are or have delivered a superior product or service that is unmatchable in the marketplace. They will do this for you because they see value in you! Once you have compiled a list you can now create a promotional sales flyer that can used to hand out in meetings with your sales prospects! DO YOU HAVE A MEMO NOTE BOOK AT YOUR DESK? - This may sound a bit trivial, but it's really a very valuable sales tool to have at your disposal when making cold calls and speaking with sales prospects. Are you a sales puppet? Before a sales prospect says, "Go ahead and send some information," ask them an additional engaging question or two (this means more open-ended questions). What's really important is that you gain some sort of commitment from your prospect. After you have determined what to send them now it's time to solidify a day, date and time for a follow-up call OR in-person meeting. Remember the following: "Without a clear agreed upon commitment you have significantly reduced your chances of closing a future sale." How much do you really listen to your prospect? Active listening makes your prospect perceive you more as a consultant rather than just another salesperson trying to push a product. To build rapport with your prospect send them an industry article that you came across. This article could be about new technology in their industry OR about one of their competitor's. You could email this article to them, but to really STANDOUT you may want to mail them a hard copy or printed version of the article that you came across. Take a highlighter or bright colored pen and highlight a few key points for them. Do what ever you need to do to let your prospect know that you have a genuine interest in earning their business. If you email your prospect a sales proposal make sure that you also mail them a printed version of your proposal as well. With your mailing include a hand written thank you note for their time and notate that you very much appreciate the opportunity to earn their business. Limit your target list of prospects to a defined number (i.e. 100) and focus your new business development efforts on these targets. As you convert a prospect to a customer rotate these new prospects into your sales pipeline. This will help to make the best use of your time and create a more manageable sales environment. "Go back to your database from one year ago and pull up every single sales prospect who told you that they were not interested." Then say the following: "(First name of prospect), I hope that you admire my persistence, this is (Insert your name) calling from (Insert your company here) and I had tried you one year ago and you were not interested. At the time, I was calling to set up a visit to your office to discuss how (Insert a benefit such as how you can help your prospect save time, money or help them do "something better" or "more efficient.") and I know that people change their minds all the time and it really never hurts to see what else might be out there, how does next (Insert one day and time here) or next (Insert another day and time here) to drop off more information? PAUSE. Is your boss instructing you to make 50 or more calls a day? Let he or she know that I think they're nuts. I bet you all the vintage phones that I own (except my 1902 Western Electric Non-Dial Candlestick Phone and my 1932 Western Electric "202" with Dial) that they're WRONG and they know NOTHING about sales! If you do just a little bit of online research on the company you're calling prior to your telephone call then all you need to make is 15 to 20 calls a day or less. I guarantee you that you will achieve 10x more results and your closing ratios will increase dramatically. Listen to Jim Cramer and how he conveys his feelings and you will learn how I feel from an emotional point of view - Boss, you know NOTHING about selling and I need you to stop poisoning my subscribers - YOU KNOW NOTHING! Sales Manger - You're fired! People change their minds constantly and remember that nothing is ever set in stone. Your prospect may say one day that they're happy with their provider, but these feelings are just temporary. Sales is all about planting seeds of information in a very non-intrusive way and then when something does happen with their current vendor,(i.e. not being treated the way that they should be treated) who da ya think their going to call? Who do you think they just might give a chance? Take a good guess? How are your dress shoes? Mr. Cold Call always keeps a brown and black shoe polisher in his car and office to shine his shoes. Are you always on the road? Try listening to motivational CD's in your car it will help you to think positively. The more positive you are the more you will sell! You need to make cold calling fun or you will not last at your job. On a notepad write down the type of voicemail message that you leave for your prospect—this is a great way to maximize what voicemails are working and which ones are not! If a prospect will not return any of your calls then on your next voicemail message offer to give them a $5 gift card to Starbucks when they call you back. Be enthusiastic on the telephone because your enthusiasm is contagious! Make sure that you are using contact management software like ACT to keep track of your sales. Use motivational quotes on your calls to inspire your prospects to take action. People who are against cold calling say that it doesn’t work. Why do they say such a thing? Because they can’t cold call and for them it's better to put something down than face the reality that they just are not good enough! Find free leads by visiting the online websites of local associations and chambers in your area—many of these organizations list their members online! Send hand written thank you notes to potential prospects versus emailing them. If you only call your prospect a few times and then give up then you don’t understand the power of advertising and repetition. Be aggressive don’t be assertive. Listen to motivational tapes as a means for inspiring your prospects on the telephone. If you want to get a callback then inject your personality when leaving a voicemail message for your prospect. Remember this quote when contacting executives, Pleasant persistence reduces resistance. If you are not excited then how can you expect your prospect to be? Send confirmation emails after you have set up an appointment. Send a friendly reminder email the day before your sales appointment. Be consciously aware of how your attitude affects others. Don't let your personal life interrupt your professional life. Bring bagels to your prospect's office to spark their interest. Look at your prospect's website and try to incorporate an aspect of their site into your message. This could be a "shared interest" that both of you have that you saw on their biography. Or, perhaps you saw a recent news story or new product that they introduced. Do whatever you need to do to show them that you have a genuine interest in speaking with them!